Whether set with exceptional quality side stones like diamonds or sapphires, or a simple solitaire diamond setting, we offer the most beautiful and durable metals - 18k gold and platinum - and all of our settings have strong prongs and will last for a lifetime. All of our 3-stone rings below have diamonds that are near-colorless (I color or better) with no visible imperfections (SI clarity or better). Also, make sure the precious metal you select for the setting matches the jewelry she wears most often. All rings are available in yellow gold for the same price. 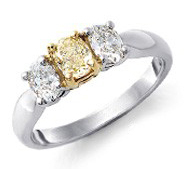 We also can create any ring with any color and clarity of diamonds. Please call 1-888-DIA-EXCH for more information.